Put four +1/+0 counters on Avian. After Avian attacks or blocks a creature, discard a counter. 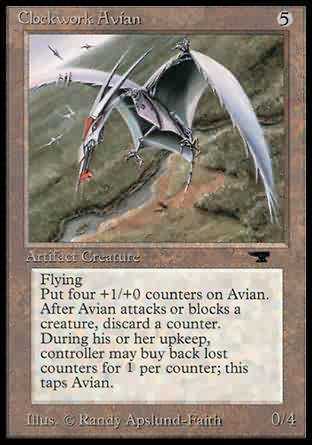 During his or her upkeep, controller may buy back lost counters for 1 per counter; this taps Avian. X, T Put X +1/+0 counters on Clockwork Avian. Play this ability only during your upkeep.